Red-Tailed Tin Foil Barbs are excellent choice for those aquarium enthusiasts who like large, active and fast-swimming fish. They can be great community fish but only if you select the right tank mates for them. Those smaller size aquarium mates will usually either end up getting eaten up or bullied upon but those aggressive ones will attack and kill your barb instead. But before we move on further, let us understand the requirements and their behavior in general. Tin foil barbs are tropical fish meaning that in the wild, they can be found living in hot and humid tropical regions in rivers having fast-flowing waters. Being a tropical species they will thrive well when provided with living condition with temperature ranging from 25 to 28deg Celsius and thus your choice on selecting the right community tank mates to mix with your tin foil barb will largely depend on this criterion. Your pet fish can be overly sensitive towards whom you decide to put in together with them living in the aquarium, so choose wisely. 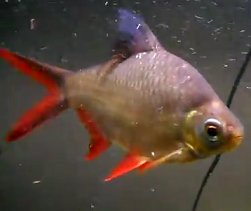 As mentioned earlier, small sized aquarium fish like neon tetra, guppy, rasbora will ended up becoming a meal but large fish like cichlids (depending on which type) can also pose a problem because tin foil despite their large size, are generally quite weak to be able to defend themselves against any aggression. Among the possible fish candidates which have proven to co-exist with the tin foil without any issue are danio, giant gourami, clown loach, arowana and catfish while other choice of companions like red-tailed black sharks, bala sharks, clown knife, blood parrot cichlids and oscars should be on trial-and-error approach coupled with close monitoring. But before you get overly excited on getting new tank mates hoping for your barbs to make new friends, just make sure that your aquarium is large enough to accommodate whatever living creature you decide to put in it. Moreover, your pet fish can grow close to 1 foot in length in just less than a year and somehow it’s not practical especially for those people who keep 8 - 12 fish in a tank because of their compulsive buying behavior. Note that you will only need at least 5 of them for the fish to school, so avoid putting large numbers together especially when you are also getting other types of fish as well to set up a community aquarium. The minimum tank size should be 4 feet and anything smaller than that is definitely a no-no. Sometimes, the idea on mixing your tin foil barb with other community fish should take into consideration whether in the future you want to breed your pet fish. Overcrowding the tank with other species might complicate the situation because the eggs practically have no chance to avoid getting eaten because not only the other fish species will gobble them up but also the other tin foil barbs including the parents which will join in the feeding frenzy as well. In order to have higher chance of successfully maintaining a proper and well-balanced community tank, also try to add aquatic vegetation. There are a lot of benefits to it. First of all, it helps to improve the water quality by consuming the fish waste and releasing oxygen to the water. Also presence of plants will also help to create the harmonious environment for all your living fish species in the tank as they have place to seek shelter and less likely to get startled compared to a barren empty fish-only tank. If you are moving in that direction just make sure that you are adding those plants which are hard leaves, fast-growing because tin foil barb are excellent plant eaters. Finally before you proceed with your plan, just make sure that you have at least talk to a friend or fellow aquarist who have kept tin foil barbs before and if you have the chance get a good first hand look on how the fish behave before you start with your project then that would be even better. Personally I have seen fish tanks having tin foil barbs living harmoniously with arowana in a very large setup and I’m really impressed with it. If you are looking forward towards having the perfect community aquarium, first thing first, get an extremely huge fish tank and then slowly add the fish together and monitor their interactions. Just try the suggestions which I’ve mentioned earlier on the possible tank mates and everything else after that is up to you. Comparing Between Different Fish Filters (Advantages and Disadvantages). How about other brands like the BiOrb?